Flood disasters have incurred remarkable costs to humans and the economy. Floods affect not only the local but also the national and world economies. However, the impact of floods on the construction sector’s GDP growth in Malaysia is not known. The purpose of this chapter is to analyse the effects of flood disaster on the construction sector’s GDP growth in Malaysia using time series data for the period 1960–2013. 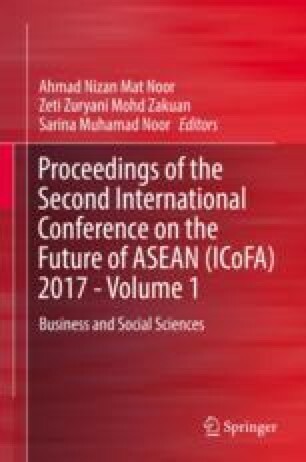 In addition, the chapter also explores the existence of short-run and long-run relationships between the construction sector’s GDP growth and flood variables in the case of Malaysia. To achieve the objectives, the study employed the autoregressive distributed lag (ARDL) method and the error correction model (ECM) in examining the long-run and the short-run relationships, respectively. In addition, the augmented Dickey–Fuller, Phillips–Perron and Kwiatkowski–Phillips–Schmidt–Shin unit root tests were used to examine the stationarity of the series. The results show that flood size and flood damage influence the construction sector’s GDP growth the most in the short and long run, respectively. Several policy implications arise from the results. First, there is a need to develop a new method of construction so that the infrastructures and buildings are durable, as flood disasters cannot be prevented. Well-developed infrastructures and buildings are able to prevent massive damages in the long run. Furthermore, the construction sector should prepare sufficient stock of items such as basic metals to prevent temporary setback in the short run. The authors wish to thank the Ministry of Higher Education Malaysia for funding this study under the Long Term Research Grant Scheme (LRGS/b-u/2012/UUM/Teknologi Komunikasi dan Informasi). The views expressed in this study are those of the authors and do not necessarily reflect the views or policies of the ministry or the project team. Any errors are the sole responsibility of the authors. Queensland Flood Report. (2012). Detailed reports on notable Queensland floods. Australian Government Bureau of Meteorology. http://www.bom.gov.au.